Nash has never gotten over the loss of his brother, Luke. Not even opening up the coffee shop that they'd always dreamed about has filled that missing piece in Nash's heart. So, the last thing he needs is Luke's old best friend, Tyler showing up. Worse yet, the guy is volunteering to help Nash during one of his busiest weekends of the year. As soon as Tyler sets his eyes on Nash, he's a goner. In all the years that have passed since they've last seen each other, Nash has grown up and then some. Tyler doesn't know it's right for him to make the moves on his dead friend's brother. Yet, he can't deny the connection that's forming between them. Will Tyler be able to deny his needs? If so, will he be making the biggest mistake of his life? This work has been previously released. Nash and his brother Luke had a dream to run their own coffee shop. But life had another plan. Nash worked on their dream and Luke went off to Afghanistan...Luke never came back and now Nash is working their dream alone and he won't admit it but he's floundering. 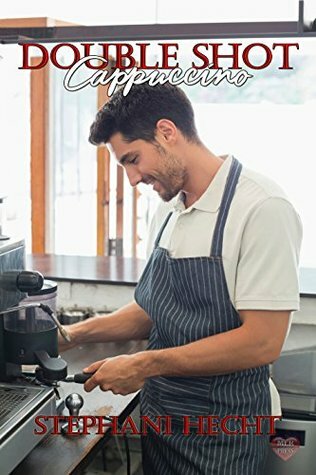 The coffee shop is successful enough, Nash thinks he's dealing or at least that is until the day Janet, his friend and most trusted employee says she's leaving. The same day that Tyler, his brother's best friend and his childhood crush walks into Coffee by Nash and Luke shattering is confidence and offering to help him out of the tight spot that Janet is leaving him in. Nash knows he's not dealing he's drowning but what a guy to do but say yes to Tyler's offer to help. One week and then Tyler's gone. Nash can do it after all Tyler's not even gay, right? Wrong. Tyler and Nash spend a week working and getting to know each other. For Tyler it's spent getting to know the man that Nash has become. For Nash it's a week spent fulfilling his childhood fantasy. 'Double Shot Cappuccino' is a second release and judging from the 60 pages that the original release is shown to have this second edition has been expanded to 73 pages and while it was an enjoyable story there really weren't any surprises to be found. I liked Nash. Nash stood up for what he believed in and was loyal to his friends and genuinely cared about his employees. Tyler sadly did not endear himself to me and even at the end when he did the right thing. I still felt that Nash deserved better. Unfortunately even with the increased pages I found that I still wanted a bit more. More...about Colby. Nash's part-time employee who seems to be so much more than he lets the world see and I would have liked more detail at the end. Buylinks are provided as a courtesy and do not constitute an endorsement of or affiliatioin with this book, author or booksellers listed.